A Push To Help U.S. Veterans Fight Homelessness Last year, the number of homeless U.S. veterans on a given night fell 12 percent from the year before. But tens of thousands were still on the streets, and more could soon join them as troops return home. President Obama has vowed to end veterans' homelessness by 2015. 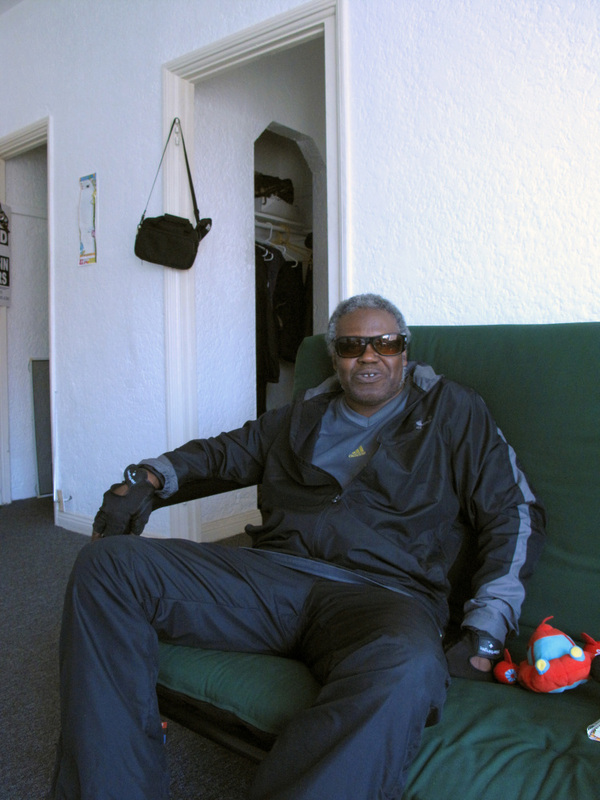 Veteran James Brown relaxes in his apartment, which he recently moved into after spending decades on the streets. But today, Brown is a different man. Wearing sunglasses and an athletic outfit, he bounds up the stairs to his new home, a fourth-floor walk-up. "Apres vous," he says, opening the door to a small, sparsely furnished studio apartment. For Brown, it might as well be a mansion. "I got my own lights, refrigerator, a fan," he says. He also has what he calls a spectacular view. All that's visible through the window is a brick wall. But Brown moves to one side and points to a sliver of sky. "From here, this angle, it's incredible," he says. "Along the horizon, it's palm trees. They crest the top of this hill. And then just underneath are all these little quaint homes; it's like a quaint village. You'd swear you were in the Swiss Alps." It's a far cry from where he used to live. Brown, who's on disability for mental and physical problems, is one of about 30,000 homeless veterans who have been moved into permanent housing in the past three years. It's part of an ambitious campaign by the federal government, local agencies and nonprofits to help former servicemen — and a growing number of female veterans — who often are so down and out, they don't know where to turn. "I believe we can absolutely do this," says Christine Marge of the United Way of Greater Los Angeles, which is overseeing a project to end veterans' and chronic homelessness in the city. Marge is optimistic. A food tent on Venice Beach, west of Los Angeles, offers a meal to homeless people and others in need. A new project in the area has the goal of reducing the area's homeless military veterans. "And that's not to say that there won't be veterans and other individuals who become homeless over time," she says. "But we're creating a system that can quickly identify those folks and move them back into housing." Marge says the project has cut the red tape that often discourages veterans from seeking help. Last year, 2,000 vets were housed here using federal vouchers that also pay for services, such as medical care and counseling. She says it even saves money. "When somebody is sleeping outside, they may be using the emergency room for their health care," Marge says. "They may be cycling in and out of prisons, and that's very costly." For all the progress that's being made, there are still many veterans living outside — more than 67,000 nationally by the latest count. 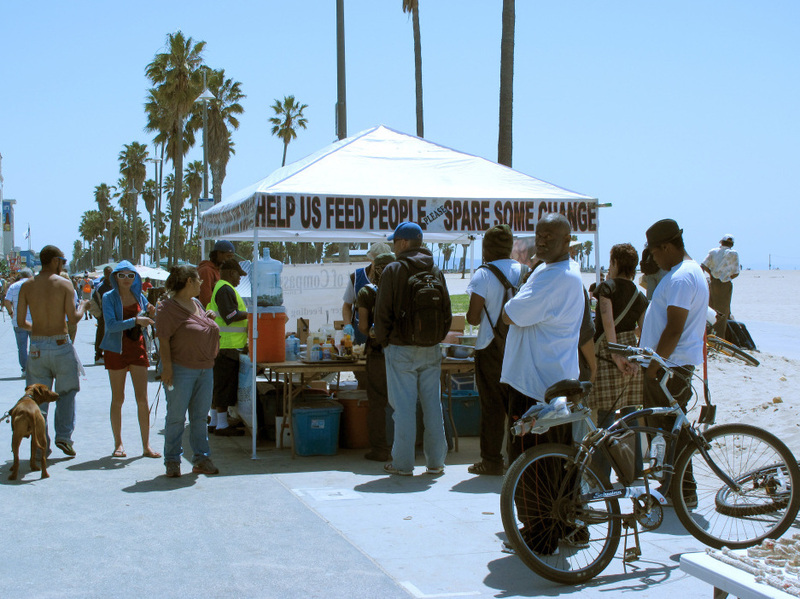 On Venice Beach, the homeless are as much a fixture as are the skateboarders and T-shirt vendors. Los Angeles Councilman Bill Rosendahl looks around and is frustrated. "I don't know what our president is thinking," he says. "2015 is just three years away, and we've not made a dent in the homeless issue. And I'm afraid as the wars either wind down or continue, they're going to continue to come out more and more seriously damaged." Rosendahl says many of those returning from Afghanistan and Iraq have mental and physical scars that, if left untreated, could eventually lead to homelessness. He says they need more immediate help. "The services have to be connected to that returning veteran from the get-go," he says. "And it has to be made simple and supportive. Because they're losing their energy, their minds — and then they end up on the street." In fact, the Obama administration says it's trying to do more to prevent veterans from becoming homeless in the first place. It provided $100 million this year, for everything from counseling to things as simple as giving vets money to repair their cars so they don't lose work. But Rosendahl and other advocates say there are other obstacles to keeping veterans off the streets. One is that it's not easy to find landlords willing to accept federal housing vouchers in an expensive city like Los Angeles. And they bemoan the fact that a huge veterans facility in West L.A. remains empty, when so many people need a place to stay. "It scares me a little bit when I hear people from the government say we've got X number of days to end homelessness, X number of days. It's simply not realistic," says Stephen Peck, who runs the United States Veterans Initiative, a nonprofit that helps homeless vets. Peck says he appreciates all the new attention, but permanent supportive housing — the current rage — might not be the answer for everyone. He says all veterans are different, and some might need other incentives to get back on their feet. "If you got the last homeless guy off the street in June of 2015, July first, there'd be another homeless guy," Peck says. He thinks there will have to be a constant process of reaching out to those who served their country but might need help for the rest of their lives.